Yesterday I received an email from Nectar advising me that they have a new partner mobile2points who will swap my old mobile phone for Nectar points. In the email they wanted to know if I would swap my 4 month old phone for 6200 Nectar points. 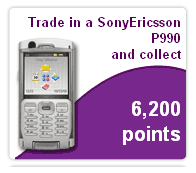 Wow thousands of nectar points, however 1 point is equal to 0.5p, so I make that £31 for a phone which is £399.99 new direct from Sony Ericsson, or £250 via eBay. So I really don’t think they will be seeing my phone too soon. ps. If you do have a phone which is in good nick, want a quick sale and more money than Nectar/mobile2points let me know.